There are two ways to upgrade a human - tinker with biology or augment with technology. So when the time comes to upgrade to human 2.0, should we become Bioshock-style splicers or Halo-esque spartans? This week we look at the science behind a genetic boost. Science fiction isn’t afraid to mess with genetics. 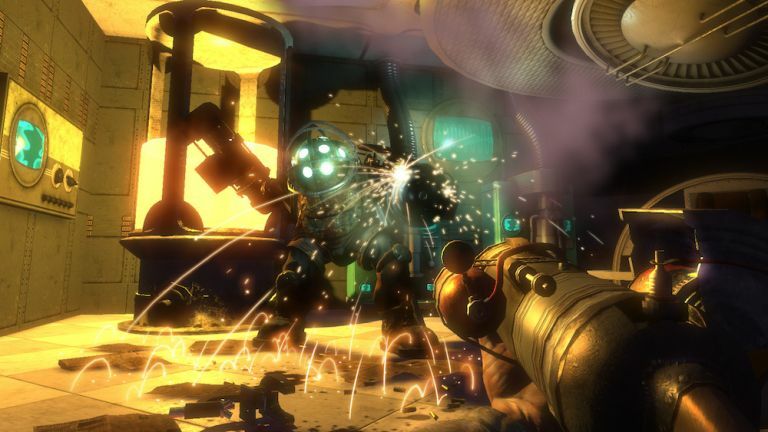 Bioshock’s ADAM is a syrup of stem cells augmented with plasmids that carry superhuman genetic traits. Prey’s Neuromod enhances cognitive abilities by splicing alien genetics into viruses delivered directly into the brain through the eyes. And Prototype's Blacklight gets in to cells and tweaks their genetic code, activating and editing dormant sequences. So how close are we to game-changing genetic upgrades? The genetic revolution started in the 1950s with two wily Cambridge scientists. With data nabbed from colleagues in London, Watson and Crick deciphered the structure of DNA and opened Pandora’s box. Since then, the field has moved fast, and it's littered with Nobel Prizes. By the mid 1970s, scientists had discovered DNA-snipping molecular scissors known as restriction enzymes, and DNA-stitching enzymes called ligases. It became possible to cut and splice the genetic code, stitching components from different organisms to create recombinant DNA. Bacteria were turned into factories, churning out molecules that they were never intended to make, and genetic engineering began in ernest. In the 1980s, everything sped up. Polymerase chain reaction (PCR) was invented, allowing chunks of DNA to be copied millions of times in a matter of hours. And DNA sequencing became automated, enabling the genetic code to be read faster than ever before. And the next logical step once you can read the genetic code? Read all of it. In 2003, the Human Genome Project was completed , revealing the recipe for a human in its entirety. All three billion letters and over 20,000 genes. And, what took an international team decades can now be repeated in days. We've got the manual to make a human being. We have the tools to read, write and edit DNA. Time to get creative. Interested in making fire with your fingers? Bioshock-style plasmids are already here. Every day scientists stuff them with genes and jam them into cells to give them new abilities. Real-world plasmids are loops of DNA most often found in bacteria, where they carry genes for useful traits like antibiotic resistance. They replicate independently of the main bacterial genetic code and can be swapped between cells like trading cards that upgrade the microbes' abilities. And, with a molecular toolkit, they can be cut open and edited, carrying thousands of letters of genetic code like miniature trojan horses. Plasmids can force cells to make new molecules or switch the behaviour of their existing genes. Bacteria will make infinite copies of them on demand. And, they can be frozen down and stored for years. But, they tend stay out of chromosomes, floating about in the cell and never meshing with the host unless some serious selective pressure is applied. They're good for a temporary upgrade, but maybe not for a permanent human 2.0 changes. Maybe that’s why splicers need a constant ADAM or EVE fix to keep their abilities topped up. Looking for something a little more permanent than a plasmid? Augments in Prey are delivered by viruses, a step up in terms of persistence. Retroviruses (like HIV) stitch their own genetic code into the code of the cells they infect, permanently merging with their host to ensure that their genes remain active generation after generation. Every time the cell copies its own DNA, it copies the viral genes too. So, scientists stripped them out, snipping away the genes that cause disease and turning them into empty genetic transport vessels. Like plasmids, these 'viral vectors' can be stuffed with genetic code, but this time they’ll stitch the new genes straight into the cell, adding the new trait permanently. This is the tech is used in Prey to deliver alien genetics into human brains. Trouble is, viruses aren't that picky about where they choose to integrate. And, if they tuck their DNA right in the middle of something important, they can ruin a crucial gene and destroy the cell they've infected. Worse still, inserting into some genes can cause cancer. Then there's the problem of getting them to infect the right cells. If you want fire at your fingertips, you'd need a virus that knew the difference between a hand and a foot. Scientists are working on improving the usability of viral vectors, but to achieve true human 2.0 without the unpredictable side effects, we'll probably need a more targeted approach. Enter CRISPR. Bioshock or Prey-style approaches to gene editing work well, but they're fuzzy and they take time. CRISPR delivers precision genetic manipulation, fast. Viruses, known as bacteriophages, inject their genetic code into bacteria, turning the microbes into miniature virus factories. But the bacteria evolved a way to fight back. When they come under attack, they store strips of viral genetic code in a CRISPR reference library so that they'll have a head start if the virus returns. When it attacks again, they check the library and an enzyme called Cas9 chops out any matching code, stopping the infection in its tracks. The great thing about CRISPR is that it's programmable. Give Cas9 a 20-letter strip of genetic code to guide it, and it'll chew up any DNA you want. These are quick and cheap to make in the lab, and the sequence can be made to match all kinds of different genes. And, when the cell goes to repair the cut, you can swoop in with any new DNA you want to add. The technique has the scientific community so excited that it was named 'breakthrough of the year' by Science in 2015. But is the world about to be overrun with splicers? Splicers can make fire with their hands, hurl balls of ice and cling to the ceiling like spiders. Morgan Yu can morph into a cup, superheat plasma and create telekinetic shields. What could we do with CRISPR at our disposal? So far, scientists have repaired a gene that causes muscular dystrophy in mice, and they're trialling the technique to reprogram immune cells in people with cancer. We're now in a CRISPR arms race as scientists across the world rush to be the first to make a gene editing breakthrough. It's early days, but the tech has a lot of potential. We could edit single letter mistakes in genetic code, switch genes off, turn genes on, make genetic tweaks. Or, best of all, we could borrow genes from other species and smash them into our cells to acquire traits we were never supposed to have, glow in the dark jellyfish genes, anyone? In 2010, scientists created the first synthetic cell. In 2016, they designed and built a genome. In the future, it's possible that we could design brand new genes of our own. Let's face it, this is still a dream, but the toolkit to make it happen is there. We still don't know what all of our DNA is for, let alone what changes we'd need to make to improve it. Good luck finding the right genes to edit if you're looking to make yourself taller, smarter or funnier, let alone inventing one that'll give you wings. And then there's the issue of inheritance. Editing adult, or 'somatic', cells could change a person Bioshock-style, but editing sperm and eggs, or 'germline' cells, could change a whole species. At the moment, genetic engineering tech is moving faster than the regulation to control it, and it's got scientists worried. We all saw what happened to Rapture when the brakes were taken off scientific advancement. Gene editing germline cells is restricted in many countries, including the UK, but in July 2017, Chinese scientists got CRISPR working in human embryos for the first time. It was a huge breakthrough, but out of 86 embryos only 28 were successfully edited, and not all of them ended up with the right gene mod at the end. Rapture, a city where the artist would not fear the censor, where the scientist would not be bound by petty morality, Where the great would not be constrained by the small! And with the sweat of your brow, Rapture can become your city as well. Luckily, no-one is trying to take edited human embryos all the way though to birth, yet. But, CRISPR opens a whole can of ethical worms, and if you’re in any doubt that human modification is coming, watch this. Pandora's box is open, and we're betting humans of the future will be genetically augmented, but it isn't the only way our species could upgrade. Come back next week when we'll be looking at tech and what it'd take to join the ranks of Halo's Master Chief or Deus Ex's Adam Jensen.